The Hill’s John Solomon is reporting Congressional leaker-in-chief Adam Schiff (D-CA) had an undisclosed meeting with the Glen Simpson, the founder of FusionGPS which is the company that produced the infamous and unverified Steele dossier, the primary evidence for the FBI’s FISA court surveillance warrant against Trump campaign adviser Carter Page. Schiff was the ranking member of the House Intelligence Committee, and he is suspected of being the primary source of leaks about the committee’s non-public hearings. With the Democrats’ takeover of the House, Schiff is now the chairman of that committee. The meeting occurred this past July at a Security conference held in Aspen Colorado. Solomon found pictures of the two together at the event. He didn’t publish the photos but he confronted the offices of the two using the images as proof of the meeting. They only met briefly? I wonder if they talked about golf and grandchildren like Bill Clinton and Loretta Lynch supposedly discussed when they had their secret meeting on the tarmac of the Phoenix Airport. The Bubba/Lynch meeting was a conflict of interests as it occurred just before FBI Director Comey (who reported to Lynch) made his speech basically declaring Hillary guilty, but he didn’t think any prosecutor would take the case. 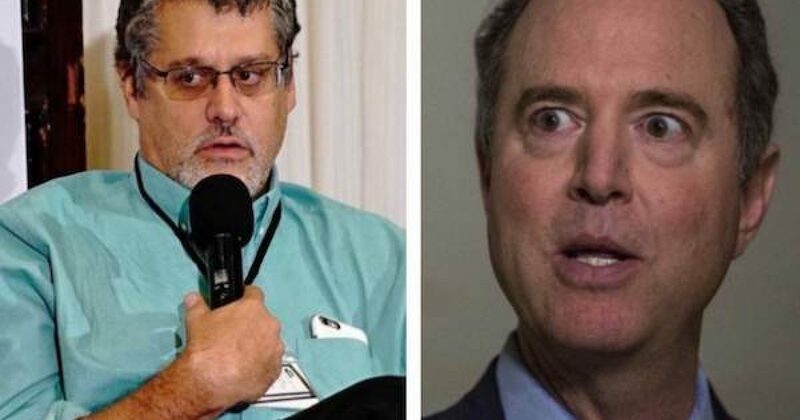 It’s hard to believe the statements of the two staffs when they are evaluated in the context of Simpson being accused of lying to the committee, and Schiff being accused of leaking committee secrets. Talk about hypocrisy! Remember when Schiff demanded that then-Chairman Devin Nunes (R-CA), be investigated for having meetings with a few of Trump’s NSC officials. The meetings were about the Obama administration’s unmasking of Trump campaign people. Schiff flipped because Nunes didn’t tell the committee about the meeting. If a Republican had that meeting Schiff would have a cow of course if he believes AOC’s “green new deal,” it would be a non-farting cow. I doubt if we will ever know of the meeting was really benign and “the conversation between the two was brief and did not cover anything substantive.” or was inside information and strategy for destroying the Trump presidency discussed. Indeed, based on their public comments about Trump, removing him from office or defeating him in 2020 seems to be a priority for them. And the Bubba Clinton/Loretta Lynch meeting was two and a half years ago, and we still don’t know the truth about the conversation on the Phoenix tarmac.